Investors question whether the home goods retailer can compete successfully in an increasingly digital world. What: Shares of Bed Bath & Beyond (NASDAQ:BBBY) fell 10.5% last month, according to data provided by S&P Global Market Intelligence. Sluggish sales and concerns regarding intensifying competition are taking a toll on the home-furnishings retailer. 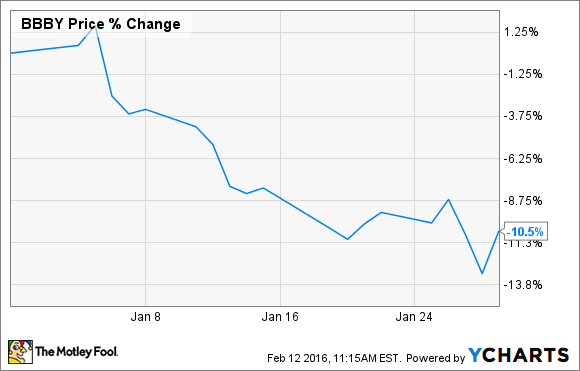 So what: Bed Bath & Beyond's January swoon comes on the heels of a nearly 40% plunge in 2015. Investors appear to be losing patience as the company continues to struggle with declining store traffic and stagnant sales. Consumers are increasingly shopping online, and Bed Bath & Beyond has been slow to adapt. To right the ship, management is stepping up its e-commerce investments. These efforts are beginning to bear fruit, with comparable sales from the company's digital channels jumping more than 25% in the third quarter. Investors, however, were unimpressed, and appear to be focusing more on the "low single-digit" decline in comps for Bed Bath & Beyond's physical stores. Now what: Bed Bath & Beyond's management is wise to focus on its online initiatives. With more and more retail sales taking place via the Internet every year, it's imperative for the company to establish a legitimate online platform if it hopes to compete with the likes of Amazon and other e-commerce leaders. If successful in this regard, Bed Bath & beyond will likely be rewarded by investors. If not, the company stands to continue to suffer from the relentless growth of online retail.